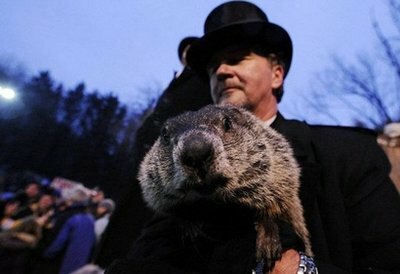 Punxsutawney Phil, the weather forecasting rodent up in Pennsylvania, saw his shadow this morning. So? So, we have six more weeks of winter ahead. Like we needed a groundhog tell us this. With forecasts of a “wintry mix” today — and another mess Thursday night — six more weeks of winter is not just a safe forecast: It’s an optimistic one. Schools in Floyd County remain closed today as overnight temperatures leaves us with uber-slick secondary roads. Will someone shoot the damn groundhog. I’ll shoot 3 of them this spring for you, they started digging on my house foundation before hibernating for the winter away from the house. First times they come out to eat, they’re getting plinked. Couldn’t they get that rodent – or whatever it is – a simple blindfold? I’ll bet they plow your roads in Floyd – no such luck in Richmond. They are already wanting to replace him with animatronics….